Generate number lines w/solution sets to algebraic problems. Is there a better alternative to xNumberLines? Is xNumberLines really the best app in Mathematics category? Will xNumberLines work good on macOS 10.13.4? 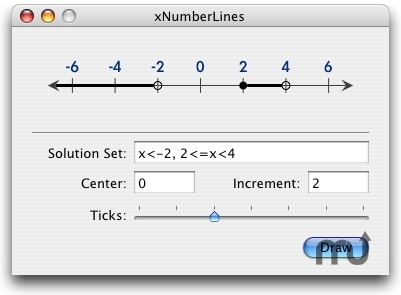 xNumberLines is a program for generating number lines with solution sets to algebraic problems (such as inequalities). These diagrams are frequently used in middle school and high school math courses. This program will automatically generate the graphical solution diagrams when you input algebraic expressions such as "x < 3" or "-2 <= x < 4". The diagrams can then be exported, copied, or dragged into other applications such as Microsoft Word, Powerpoint, Keynote, Create, OmniGraffle, etc. xNumberLines needs a review. Be the first to review this app and get the discussion started! xNumberLines needs a rating. Be the first to rate this app and get the discussion started!